Wahama head coach Billy Zuspan, right, instructs senior Anthony Ortiz to round third and head home during the third inning of Thursday night’s TVC Hocking baseball contest against Miller at Claflin Stadium in Mason, W.Va.
Wahama senior Colton Arrington, left, touches home plate during the third inning of Thursday night’s TVC Hocking baseball contest against Miller at Claflin Stadium in Mason, W.Va.
MASON, W.Va. — Although the weather has cost most teams in the area a lot of postponements, the White Falcons didn’t mind seeing a little two-out lightning roll through Claflin Stadium on Thursday night. 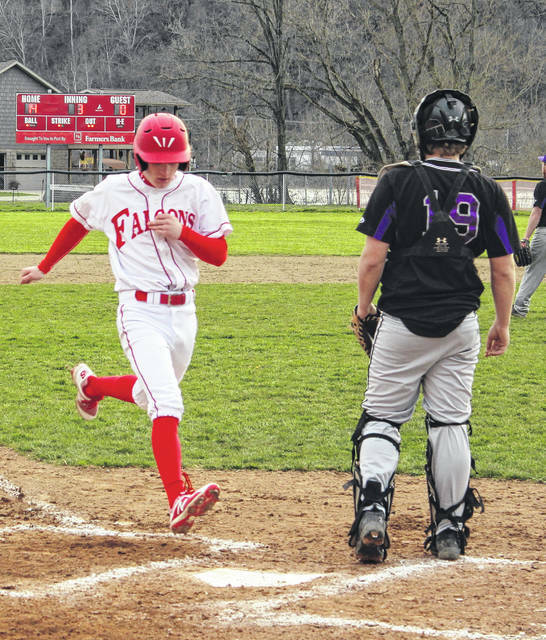 The Wahama baseball team scored 11 runs with two away — with 10 of those coming during a 15-run third — as the hosts cruised to a 16-1 victory over Miller in five innings during a Tri-Valley Conference Hocking Division contest in Mason County. 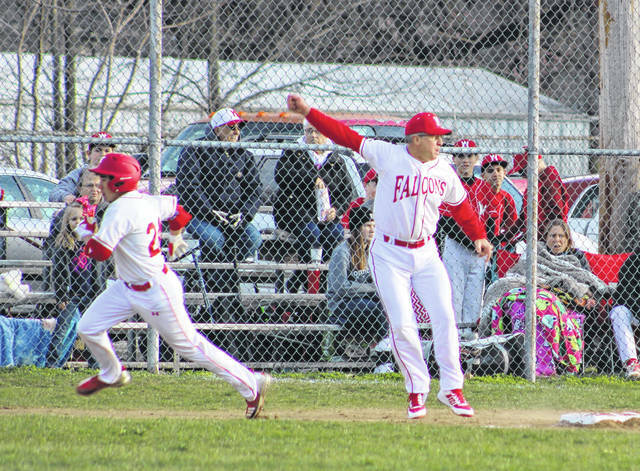 The White Falcons (4-0, 2-0 TVC Hocking) took a 1-0 lead in the bottom of the first as Dalton Kearns scored on a passed ball with two away, but that slim lead held up over the course of two full innings of play. Then, in the third frame, the Red and White simply found their groove as they sent a total of 19 batters to the plate — which resulted in 15 runs on eight hits, eight walks and two errors. In the aftermath of facing three different MHS hurlers in the third frame, the White Falcons had built a 16-0 advantage. Wahama wouldn’t have another baserunner in the contest, and Miller came up with its first hit of the night in the top of the fourth as Rusty Greenich singled to lead things off — although he was ultimately stranded at first base. Colby Bartley scored the Purple and White’s only run in the fifth after his leadoff single turned into a run after a RBI-double from Trey Hettich wrapped up the 15-run mercy-rule outcome. The White Falcons outhit the guests by a sizable 9-3 edge and also benefited from two of the three errors in the contest. Wahama stranded only one runner on base, while the Falcons left two on the bags. Following the game, WHS coach Billy Zuspan was pleased with the events of the evening — particularly the efforts his squad received from hurlers David Hendrick and Tyler Bumgarner. The two pitchers combined for eight strikeouts, a shade over half of Miller’s 15 outs. Kearns, Hendrick, Bumgarner, Tanner Smith, Colton Arrington, Anthony Ortiz and Bryton Grate each scored twice during Wahama’s third-inning explosion. Antonio Serevicz also scored a run in helping the Red and White build a 16-run advantage. Miller’s only baserunner against Hendrick came on an error to start the game, but the junior struck out six while facing the minimum of nine over three innings of work. Bumgarner surrendered one earned run and three hits over two frames while fanning two. Hettich took the loss for MHS after allowing six runs (five earned), five hits and one walk over 2⅓ innings while striking out four. Kearns and Bryton Grate paced Wahama with two hits apiece, followed by Hendrick, Smith, Arrington, Ortiz and Serevicz with a safety each. Arrington and Serevicz led the hosts with three RBIs apiece, with Smith also driving in a pair of RBIs. Kearns scored three times for the victors, while Hendrick, Smith, Arrington, Ortiz and Bryton Grate each crossed home plate twice. Greenich, Hettich and Bartley had the lone safeties for Miller. Zuspan admits that he has been impressed with the way his troops are going about handling business, particularly since games have been so few and far between through three weeks of the season. Wahama returns to action Monday when it hosts Federal Hocking in a TVC Hocking contest at 5 p.m.